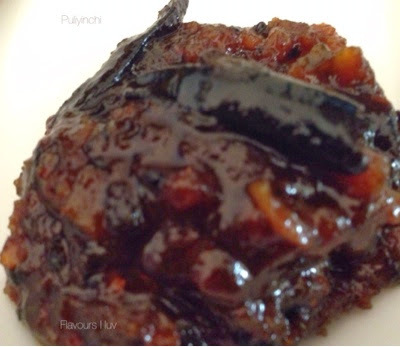 Puliyinchi or Injipuli is a traditional Kerala pickle. It is one of the favorite dishes of almost all keralites. Soak the tamarind in 1 cup of hot water for 10-15 minutes then squeeze the tamarind to extract juice and filter the tamarind juice. Heat coconut oil in a earthen pot ( manchatti ), add mustard seeds, when it splutter add dry red chillies and curry leaves. Add finely chopped ginger into it and saute until the raw smell leaves, then add chopped green chillies and saute for some time. Simmer and add turmeric powder and chilly powder, saute for some time. Pour tamarind juice, bring to boil, reduce the flame to low and cook for 10 minutes. 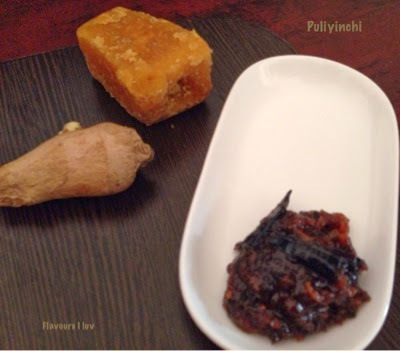 Add jaggery, reduce the flame allow the mixture to boil until the mixture is thick, pulpy and reduced by half. Allow to cool and transfer into a sterilized jar or bottle and leave to settle for an hour and Enjoy ! We can use this for a week or two by keeping it in a refrigerator. Adjust sweetness and spice according to your taste.